There’s nothing more annoying than your car suddenly spluttering and jumping, before it grinds to a halt. Whether you need a towing service for your private or commercial needs, you want to ensure that the towing service you choose is reliable. With Tows 2 Go towing services at the helm, you can be assured that you will receive an exceptional service at a competitive rate. At Tows 2 Go we set the standards in quality, reliability and professionalism in the industry. What towing do we do on the Gold Coast? Whilst we are based on the Gold Coast our service is not limited to the locality. 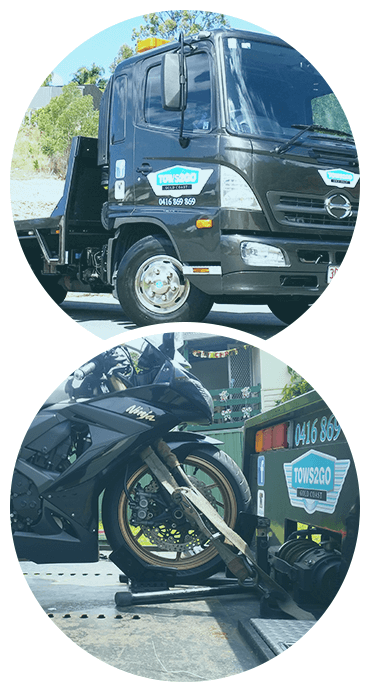 Our towing service is available to tow your vehicle from the Gold Coast to Brisbane, the Sunshine Coast and even interstate. Tows 2 Go was founded on good old-fashioned values. We believe that a great towing service, coupled with outstanding customer service should come as standard. Tows 2 Go are known in the industry for being on-time and professional, whilst providing exceptional value for money. Whether you’ve broken down or you need a car delivered to you, our team of experts will treat your vehicle like their very own. We ensure that every vehicle in our care is meticulously looked after and free from damage. We believe the devil is in the detail. When it comes to loading, unloading and transporting your vehicle you can rest assured that we take every precaution to ensure there is no damage. All our trucks and drivers are fully insured for your peace of mind. When it comes to a breakdown you can only be so prepared, usually it comes out of the blue and you are left stranded by the side of the road. Whether it’s you or a loved one, you can rest assured that with Tows 2 Go, we’ll get to you and we’ll get to you fast so you can carry on with the rest of your day with as little inconvenience as possible. Why settle for less, when it comes to your towing needs, Tows 2 Go have you covered. We believe you’ll enjoy our personalised service. When you call us, you can speak with your tow truck driver, so you can get a very real sense of how quickly we will be there to assist you. Call Tows 2 Go today and see the difference.